My birthday is tomorrow, and being the food pusher control freak that I am, I am again making my own birthday "cake." This year, though, it's not an actual cake (see My Chocolate Birthday Cake), but instead it's a birthday pie. An ice cream pie. 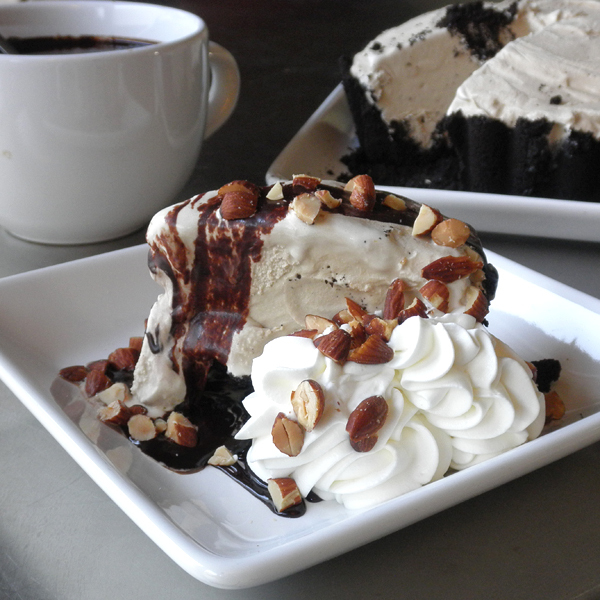 Mud pie. With coffee ice cream. My first ice cream pie experiences were from Baskin Robbins. My dad always liked to have the Jamoca Almond Fudge ice cream pie from Baskin Robbins for his birthday. I think we would also get mint chocolate chip flavor sometimes. Those were special pies. Then in college, we would go to the Chart House in Long Beach, CA for their mud pie. Now THAT's dessert awesomeness in my book. 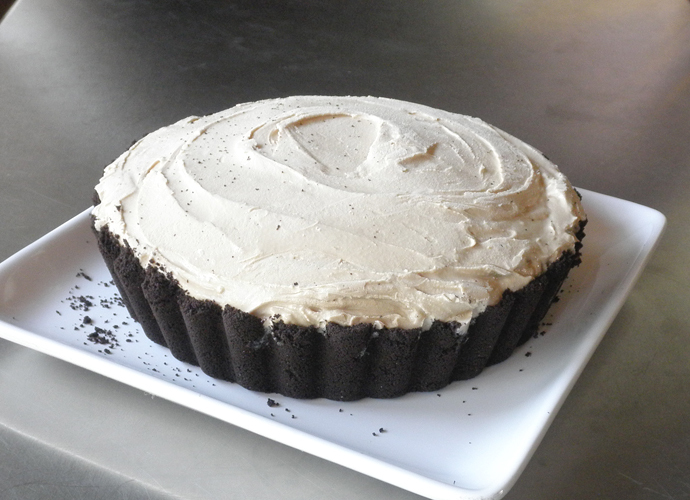 They put a gallon of coffee ice cream inside a 9-inch Oreo cookie crust. 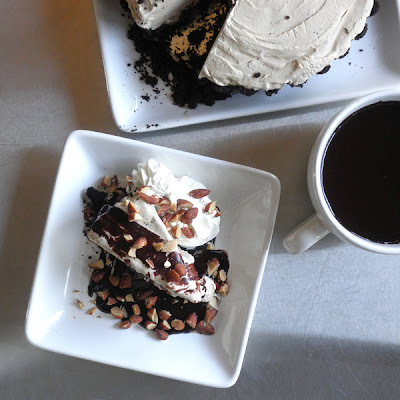 Each slice is a tower of ice cream, Oreo crust, fudge topping, whipped cream and salted almonds. Oh my gosh. Back in the '80s it they charged $7 a slice. I have no idea what they're charging these days, as I don't live near a Chart House and I don't even think the one in Long Beach exists any longer. There are other locations, but really, it's easy enough to make, and I'm making it for my birthday this year. I'm hoping that our family members who come to our celebration this evening don't want the coffee version. I've made a cookies 'n cream version to avoid wasting my coffee mud pie on slacker kids who will want a piece but not eat it when they taste the coffee. Yes, I am a planner. And a judger. It's my birthday. I can plan and judge if I want to. The "recipe" for this pie is so simple, it almost seems like a "duh" recipe, but I did discover how a Kitchen Aid mixer makes it a lot better. 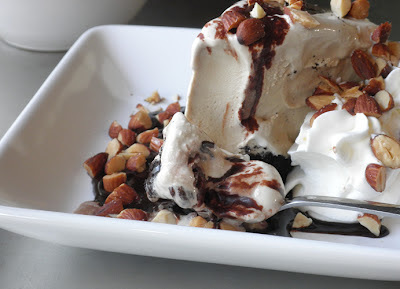 So, read on, and know you can do this with almost any ice cream, unless it has ribbons of sauce in it. The Kitchen Aid method will mess that up. Enough. On to the recipe. Pulverize the Oreo cookie wafers in a large zip top bag or in a food processor. Add melted butter to bag or food processor and completely mix the cookie crumbs with the butter. Press cookie/butter mixture into a 9-inch pie pan--bottom and sides. Press in pretty firmly so it will hold up to cutting later. Set crust aside. Soften the ice cream by letting it set on the counter for about 20 minutes (maybe longer depending on how hard it is when you start). When ice cream is soft enough to scoop out easily, scoop it in large chunks into the bowl of your stand mixer fitted with a paddle attachment. Mix on low speed until ice cream is smooth (about 1 minute). Spoon/pour ice cream into prepared crust and carefully spread it with a silicone spatula into the pie crust, taking care not to pull away the crust as you spread. Cover loosely with plastic wrap and freeze at least 8 hours. Once the pie is frozen, it's ready to cut and serve with room temperature fudge sauce, whipped cream and nuts.